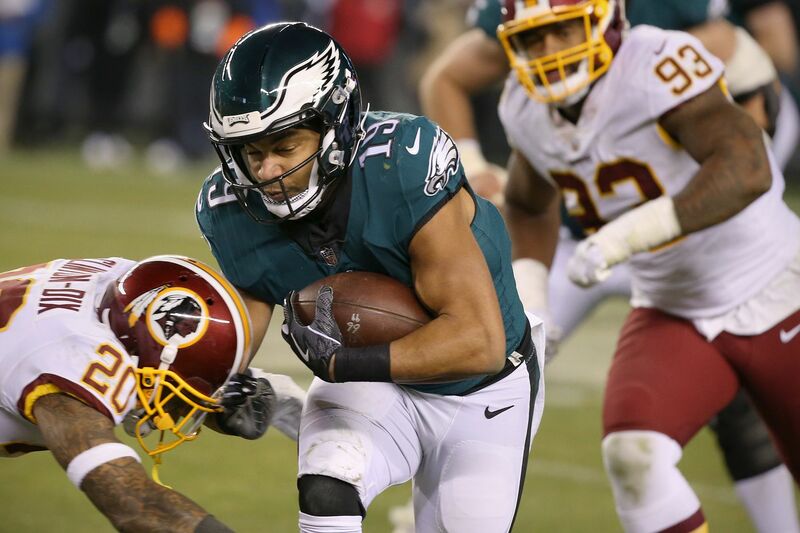 Golden Tate tries to evade a tackle by Washington's Ha Ha Clinton Dix during the Eagles' win on Monday night. For the first time all season, perhaps with the first New York Giants game as the exception, the Eagles offense looked vaguely as it did in 2017. The final score — a 28-13 win over the spiraling Redskins — didn’t suggest that the Eagles have yet reached the heights of last season’s explosive unit. And there were dubious moments from both coach Doug Pederson and quarterback Carson Wentz. But the Eagles marched up and down the field nearly all of Monday night at Lincoln Financial Field — gaining a season-high 436 yards. They held the ball for nearly 40 minutes. And they did so with purpose, if not poise. Pederson came in with a clear plan. The Eagles would stay balanced — at least close enough so that the Redskins would remain on their heels. Wentz would work from under center — at least more than normal — so that play-action would be effective and not merely some perfunctory fake. Play action also got Wentz moving. He wasn’t asked to roll out much, but using his legs, rather than taking a short drop out of the shotgun, seemed to inject life into the mobile quarterback. The Eagles ran 33 times for 130 yards with Josh Adams leading the way for the third straight week with 20 carries for 85 yards. Wentz completed 27 of 39 passes for 306 yards and two touchdowns and wasn’t sacked for the first time this season. The offensive line built off last week’s win against the Giants. Pederson also called screens that took advantage of the aggressive Washington front. He figured out a way to get Golden Tate (seven catches for 85 yards and a touchdown) involved more than he had in his first three games in Eagles green. And when the Eagles got ahead, they hammered the Redskins on the ground, nearly doubling them in time of possession. Is this kind of offense sustainable? Probably not, especially if the Eagles have greater aspirations than just winning the NFC East. But it might just be enough to overtake the Cowboys. It certainly was against the Redskins, who were down to their third quarterback — Mark Sanchez, the Mike Myers of backups. Wentz wasn’t exactly the hero of this horror movie of games. He tossed a brutal red zone interception — his first since 2016 — in the third quarter. He mishandled a few snaps. And he was errant with several passes. But Wentz had more than enough moments to compensate for the mistakes. He spread the ball around, despite the narrative, per a report, that he had been favoring Zach Ertz at the expense of others. ESPN cited a source who said that said the Eagles were “over-targeting” Ertz. The tight end saw 111 passes entering the game, but he had caught 76 percent of them. Ertz was once again Wentz’s top target. He caught 9 of 10 passes for 83 yards and set the franchise record for catches in a season with his seventh catch, passing Brian Westbrook’s mark of 90. How could anyone believe Ertz was the problem? Even if Wentz was locking in on him too much, it would be low on the list of offensive issues this season. “It was an anonymous source. If it was one of my teammates, I don’t have a motive by any means,” Ertz said. “I feel like [I] have a great relationship with all my teammates." The Eagles had gotten away from receiver Alshon Jeffery in recent weeks. In his previous four games, he was targeted only 15 times. Wentz did go to him early, but Jeffery ended the game with only five targets and three catches for 31 yards. Wentz, it should be noted, forced his pass that was intercepted by Redskins cornerback Josh Norman to the slanting Jeffery. But he bounced back and did enough to help the Eagles claim their first winning steak of 2018. For a team that won nine straight last season, it’s small potatoes, and placed into that context, a reminder that the offense is still far from that kind of production. For the first time in six games, the Eagles scored on their opening drive and in the first quarter. Balance was the theme. The Eagles ran more than they threw — a 7-to-5 ratio — and the mix appeared to keep the Redskins guessing. Adams rushed five times for 28 yards. But the Eagles didn’t end their first quarter scoreless streak without their quarterback’s improvisation skills. On first and 15, Wentz rolled right, and pointed to Tate, who was in the flat, to release upfield. The receiver did as told and caught a perfectly-placed floater for 19 yards. Seven snaps later, Wentz extended the play, stepped up and zipped a 6-yard bullet to Tate in the end zone. Pederson had some peculiar calls over the next 15 minutes. On third and four on the Eagles' next possession, Darren Sproles took the handoff and was dropped for no gain. The run call wasn’t necessarily a bad one, but it was an odd time to give the 35-year-old, who had been sidelined with a hamstring injury, his first carry since Week 1. Two series later, the Eagles advanced all the way down to the Redskins 2. But the play calling became suspect. On first down, Wentz threw an errant pass to Matthews on a slant. On second down, Adams was dropped for a 1-yard loss. And on third down, after an Ertz false start, Agholor caught a 7-yard pass down to the Redskins 1. Pederson went for it on fourth down. But after a timeout, with Ertz on the sideline, he had an under-center Wentz hand off to Adams. Linebacker Zach Brown came in untouched and tackled the running back in the backfield. But the defense forced a three-and-out on the Redskins' ensuing series, and after a Sproles' 15-yard punt return, the Eagles had the ball on the Washington 40. Clement picked up 11 yards on the first of many successful screens, the Redskins were called for roughing the passer, and Sproles motored to the left, behind center Jason Kelce for a 14-yard touchdown run. The Eagles had rebounded despite shooting themselves in the collective foot. Fortunately, they had two feet of offense. It wasn’t the prettiest of performances. But it was enough to keep the season and their playoff hopes alive with a showdown in Dallas next week. Did it take them too long?